Meet Ifeoma at the Owl Bookshop in Kentish Town. 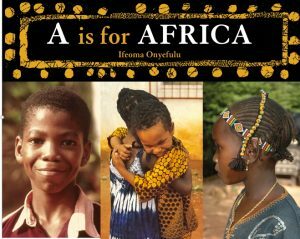 A is For Africa has been re-released by Francis Lincoln Children’s Books in a new edition from this month. (May 2016). ‘From Beads to Drums to Masquerades, from Grandmother to Yams, this photographic alphabet captures the rhythms of day-to-day village life in Africa. Ifeoma Onyefulu’s lens reveals not only traditional crafts and customs, but also the African sense of occasion and fun, in images that will delight children the world over’. To celebrate this splendid new edition Ifeoma will be in the Owl Bookshop in Kentish Town next month. Ifeoma will also be talking about writing her book, and there will be stories, questions and answers, and traditional games. See you there! ‘A clever rearrange has made Kentish Town’s Owl Bookshop easier to negotiate: classic fiction has been given room to expand and there are some armchairs to help you relax while you mull over your choices. Trading for a good three decades, the shop covers food and drink, gardening, sport and fiction, with all stock judiciously laid out. There’s a strong children’s section to the right as you come in and a smart selection of stationery and magazines for sale’. The store is definitely worth a visit, especially with Ifeoma in residence for the afternoon. We look forward to your visit.